Stony Brook, NY - May 22, 2015 - If you’re looking for live musical theatre right in your own back yard Stony Brook Village is the place to be. 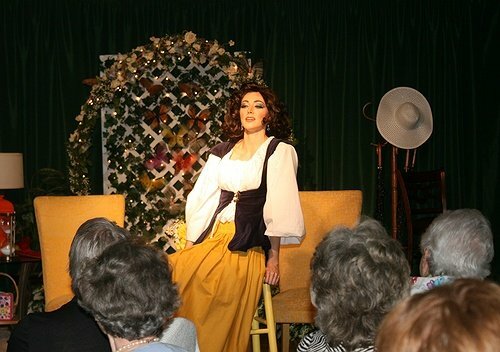 “The Elizabeth Taylor Story,” now playing at WMHO’s Educational & Cultural Center, is not only hilarious and entertaining but also compelling as it touches on the very dramatic life of this iconic Hollywood star. A St. George Production, performances take place Wed., Thurs. Fri. & Sat., 11:30 am, Sun., 12:30 pm. Show dates are May 28, 29, 30, 31, June 3, 4, 5, 6, 7, 10, 11, 12, 13, 14, 17. They include a high-tea luncheon catered by Crazy Beans Restaurant. Advance reservations are required. Gen. Admission, $48; seniors 60 & over, $45; groups of 20 or more, $43 pp. For further information call 631-751-2244 or visit here. Founded in 1939, The Ward Melville Heritage Organization (WMHO) is a not-for-profit corporation that develops and fosters community enrichment through cultural and educational experiences. WMHO accomplishes this by enhancing and interpreting its historic and environmentally sensitive properties and by utilizing state-of-the-art technology. For more information, please click here. Subject: LongIsland.com - Your Name sent you Article details of "“The Elizabeth Taylor Story” Limited Performances Now through June 17 at WMHO’s Educational & Cultural Center"